Awake after his long sleep, Albert the bear can’t wait to spend time in his own special tree, which is always so quiet and peaceful. But not today. Today Albert’s tree is crying. How can he cheer it up? Albert’s friend Rabbit suggests digging holes for Tree to play in, but the wailing continues. Eating grass always makes Caribou happy, but an offering of grass does nothing to stop the noise (which is getting to be a bit much). “STOP CRYING!” roars Albert, but the bawling only gets louder. There’s just one thing to do: Albert climbs up to his favorite branch and gives Tree a hug. To Albert’s surprise, he hears a little voice say, “I’m afraid of the big hairy monster.” Who said that? And just who is the big hairy monster? Jenni Desmond is the illustrator of On the Night of the Shooting Star by Amy Hest and the author-illustrator of The Blue Whale and The Polar Bear, among other books for young readers. Jenni Desmond lives and works in London. The picture book is as cozy and familiar as a teddy bear's embrace, but smart touches elevate the story...There are lots of children's books about cute bears who talk like people, but few are as cleverly put together and as witty as Albert's little adventure. The endpapers are particularly clever: the front, representing winter, includes cutaways depicting the animals’ underground homes; the back surveys the same scene above ground in early spring. This is ideal for a springtime story hour, paired with April Pulley Sayre’s Eat like a Bear (2013). 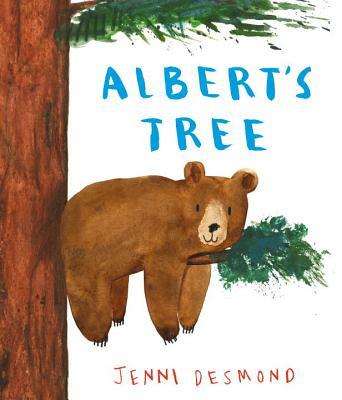 An ideal read-aloud for a storytime about bears or trees, or enjoyed one-on-one. A sweet addition for most collections.